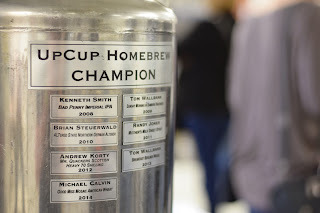 Last Saturday Upland Brewing Co. played host to the 8th Annual UpCup at their Profile Parkway production facility in Bloomington. This is a homebrew competition where entrants submit two bottles of beer and indicate which BJCP style category they would like to be judged against. Judging started at 10am and a flight of 9 or so beers were assessed. After scoring and a bit of lively discussion, the judges would then select a beer to proceed to final round of beers. After a break in the action a second flight was judged in the early afternoon with the same procedures as the morning flight. After the results were collated, a final flight known as best in show was judged to determine the top entries. The event also served as an American Homebrewers Association (AHA) rally with the festivities starting at 3pm. Current AHA members were invited to attend and were provided opportunities to take a VIP tour of the brewery and enter into a prize raffle. Multiple vendors of brewing supplies were also present. 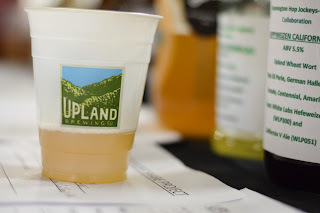 The local homebrew club, The Bloomington Hop Jockeys, were on hand to pour experimental homebrew batches that all used Upland’s Wheat Ale wort. 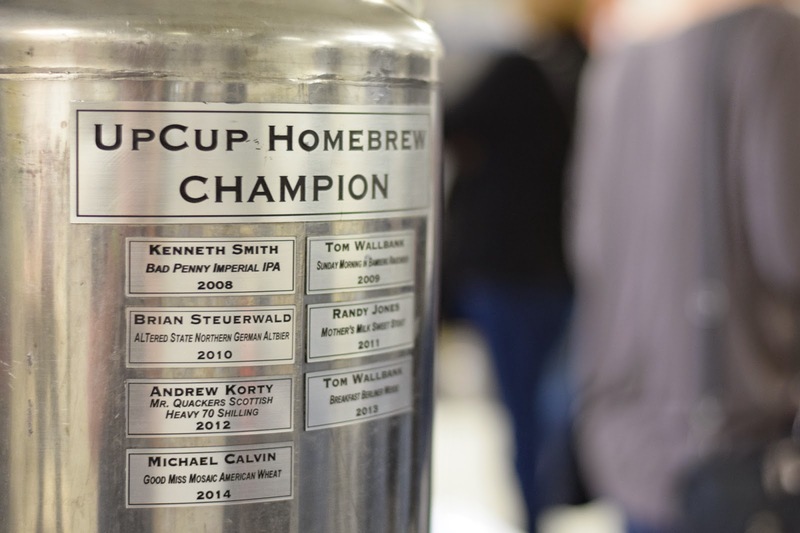 It was evident from the outcomes that the homebrewers really embraced the chance to be creative with the latter part of the brewing process. Chris’s beer will be brewed on Upland’s commercial system and entered in the 2015 Pro-Am competition at the Great American Beer Festival in Denver, Colorado. It will also be featured on tap at all Upland locations later this year. I sampled a range of great beer during the day and it only reaffirmed in my mind what a flourishing homebrew community we have here in Indiana. I can also attest from personal experience how much joining a local homebrew club has helped improve my homebrew game. If you are an experienced brewer looking to hone your techniques or a beginner with more question than answers the AHA has an online directory to find a homebrew club near you. It’s one of the best ways you can prepare for competition next year. 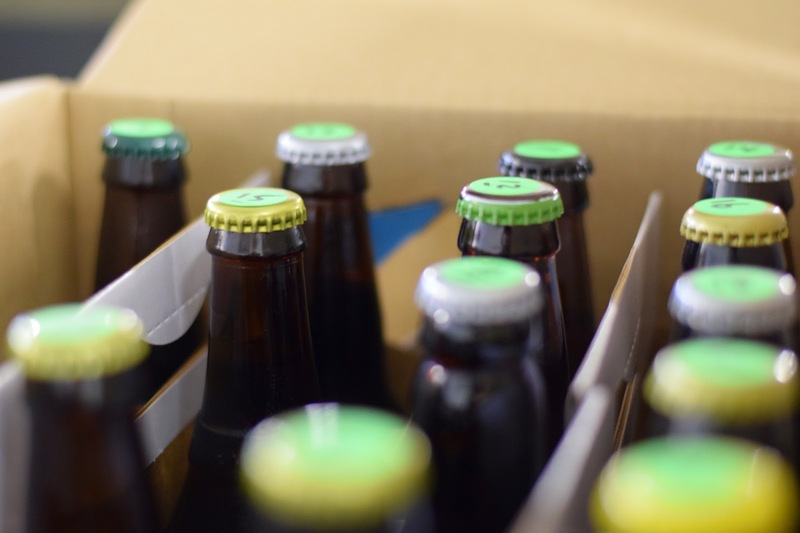 — By Ross Hughes, indianabeer.com blogger, homebrewer, aspiring Cicerone and all-around beer nerd. Ross enjoys a variety of beer styles and is always looking to train his palette with another tasty ale. Next → Next post: Toast Homebrewers or go learn about homebrewing! Saturday, May 2!